32 LIVES is a transparent 32-bit to 64-bit Audio Units and VST plug-ins adapter which enables you to run your favorite 32-bit-only plug-ins, such as Vanguard, VB3 and TC PowerCore plug-ins, in your latest 64-bit DAW. There are no additional windows to open and no redundant routings to make. Your favorite 32-bit plug-ins will appear in your 64-bit DAW as if they were native 64-bit plug-ins. 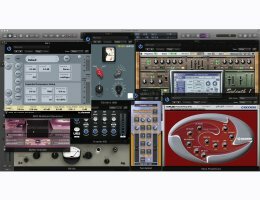 32 LIVES is compatible with virtually all 64-bit Audio Units and VST host applications, including Logic Pro X, Cubase, Ableton Live and Studio One. View the release notes for "What's New in Version 2", HERE! Mac­-Intel-only application. Requires OS X 10.6.8 or higher and an internet connection for authorization.